Can't find the Standard you're looking for? Place your order over the phone in almost any language. 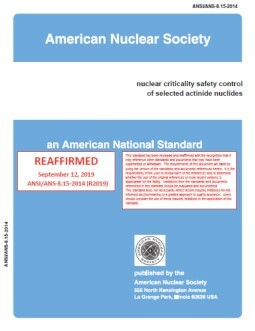 Welcome to the new standards store for the American Nuclear Society. Our partner at Techstreet is the official outlet for all ANS standards. You will need to create an account to make a purchase if new to Techstreet. This standard defines the required functions of dry storage facilities for new fuel at light water reactor nuclear power plants. Provides criteria for the timely retrieval and the subsequent processing, handling, and storage of data obtained from nuclear power plant and non-power nuclear facility strong-motion analog and digital seismic instrumentation. This standard provides requirements and recommendations for validation, including establishing applicability, of neutron transport calculational methods used in determining critical or subcritical conditions for nuclear criticality safety analyses. This standard specifies and provides requirements for the reference measurements of reactor geometry, reactivity, and operation parameters in light water power reactors. This standard provides guidance and specifies criteria for determining the MTC in PWRs. This standard provides a set of typical radionuclide concentrations for estimating the radioactivity in the principal fluid systems of light water reactors and for projecting the expected releases of radioactivity from nuclear plants. 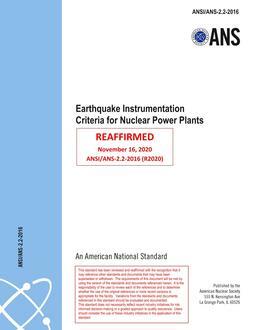 This standard specifies the required earthquake instrumentation at the site and on Seismic Category I structures of light-water-cooled, land-based nuclear power plants. his standard establishes guidelines to estimate the frequency of occurrence and the magnitude of parameters associated with rare meteorological events such as tornadoes, hurricanes, and extreme straight line winds at nuclear facility sites within the continental United States. This standard provides single parameter limits for operations with 233U, 235U, and 239Pu. Get enterprise wide access to ANS standards. Learn More!